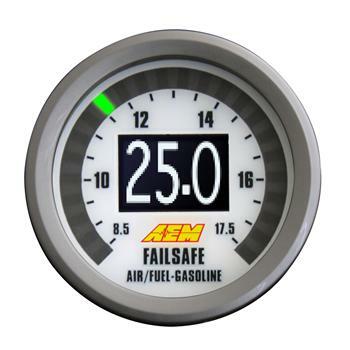 AEM Failsafe Gauge UNIVERSAL - Performance Auto Parts - Car and Truck Accessories | JM Auto Racing - Intensify Your Ride! 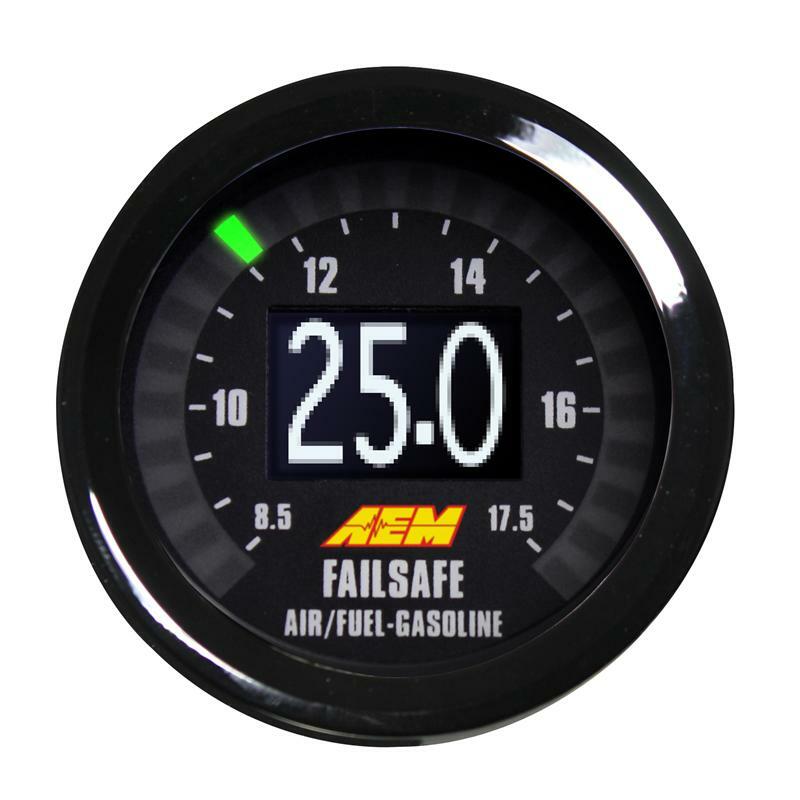 The Wideband FAILSAFE Gauge is a Universal Exhaust Gas Oxygen (UEGO—“you-way-go”) controller with an internal boost sensor, an internal data logger and a full color Organic Light Emitting Diode (OLED) display. It includes technology to activate a failsafe strategy in the event AFR falls outside of a user-defined operating window. If the AFR falls outside of the set operating window, the Wideband FAILSAFE Gauge triggers a user defined output function that can save an engine from catastrophic damage. This product is a must have for all tuned performance engines, either forced induction or naturally aspirated, fuel injected or carbureted. Any high performance vehicle owners who want a highly accurate AFR tuning tool with logging and a protection strategy that can save an engine from catastrophic failure will want this FAILSAFE device. The system contains an on-board data logger for logging over three hours of data recording (20 Hz per parameter) of AFR, RPM, boost, alarm, and others. Data logs can be downloaded for viewing in the new AEMdata software. Once installed, users connect to the gauge via a USB port and use the supplied software to log an engine’s safe AFR operating range, set minimum and maximum AFR ranges, alarm mode, time delay strategy, failsafe strategy and gauge display configuration. Users with an AEMnet-equipped (CAN bus) device can daisy chain the Wideband FAILSAFE gauge using the AEMnet connection (adapter sold separately). Non AEMnet devices can communicate with the device using the CAN 2.0B spec protocol. An analog output for O2 feedback is provided for users without AEMnet or CAN-equipped devices to hard wire the gauge for O2 feedback or logging in a stand-alone logger. Accurate AFR data is critical when tuning an engine. Running rich (very low air/fuel ratio, excessive fuel) can cause a loss in power and fuel economy, while running too lean (very high air/fuel ratio, not enough fuel) may result in serious engine damage. Using a wideband air/fuel controller during the tuning process allows you to monitor AFR and adjust tuning parameters to optimize them for maximum power and efficiency. Kit comes with 6 different faceplates and black and silver bezels.